1. JAMES1 DUFFUS was born in Forgue, Aberdeenshire, Scotland. He married MARGARET HAY June 13, 1784 in King Edward, Aberdeenshire, Scotland. 2. i. JAMES2 DUFFUS, b. April 02, 1785, Forgue, Aberdeenshire, Scotland; d. Unknown, New Pitsligo, Scotland. 3. ii. WILLIAM DUFFUS, b. February 25, 1787, Forgue, Aberdeenshire, Scotland; d. New Pitsligo, Scotland. iii. 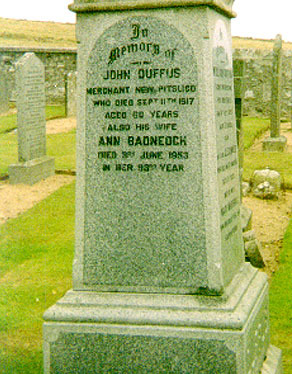 ANN DUFFUS, b. April 12, 1789, Forgue, Aberdeenshire, Scotland. iv. MARGARET DUFFUS, b. February 03, 1791, Forgue, Aberdeenshire, Scotland. v. JOHN DUFFUS, b. March 08, 1796.
vi. MORISON DUFFUS, b. March 08, 1796. 2. 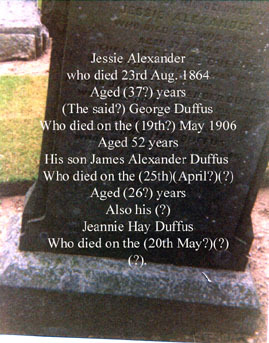 JAMES2 DUFFUS (JAMES1) was born April 02, 1785 in Forgue, Aberdeenshire, Scotland, and died June 11, 1864 age 82 in New Pitsligo, Scotland. Married Mary Wood d. March 31, 1886, age 79 years. i. MARGARET3 DUFFUS, b. January 22, 1809, Tyrie, Scotland; d. Unknown, Tyrie, Scotland. ii. ANN DUFFUS, b. February 20, 1814, Tyrie, Scotland; d. Unknown, Possibly died at birth or shortly thereafter. iii. MORISON DUFFUS, b. May 20, 1816, Tyrie, Scotland; d. Unknown, Tyrie, Scotland. iv. ELIZABETH DUFFUS, b. December 28, 1827, King Edward, Aberdeenshire, Scotland. 4. v. JAMES DUFFUS, b. August 12, 1828, King Edward, Aberdeenshire, Scotland; d. Unknown, Fyvie, Scotland. vi. MARY DUFFUS, b. December 01, 1831, King Edward, Aberdeenshire, Scotland. vii. WILLIAM BRUCE DUFFUS, b. September 22, 1833, King Edward, Aberdeenshire, Scotland. 5. viii. JOHN DUFFUS, b. February 09, 1836, King Edward, Aberdeenshire, Scotland. 6. ix. CHARLES DUFFUS, b. July 12, 1838, King Edward, Aberdeenshire, Scotland. 7. x. JANE DUFFUS, b. February 21, 1841, King Edward, Aberdeenshire, Scotland. xi. ANN DUFFUS, b. 1844, Tyrie, Scotland. xii. MARGARET DUFFUS, b. 1846, Tyrie, Scotland. xiii. JESSIE DUFFUS, b. 1849, Tyrie, Scotland, d. August 23, 1864. 3. WILLIAM2 DUFFUS (JAMES1) was born February 25, 1787 in Forgue, Aberdeenshire, Scotland, and died in New Pitsligo, Scotland. He married MARGARET DAWSON. Fact 1: married - Cattenarch ? 8. i. WILLIAM3 DUFFUS, b. 1820. 4. JAMES3 DUFFUS (JAMES2, JAMES1) was born August 12, 1828 in King Edward, Aberdeenshire, Scotland, and died Unknown in Fyvie, Scotland. 9. i. JAMES4 DUFFUS, b. May 01, 1851, Fyvie, Scotland. iii. JOSEPH DUFFUS, b. September 05, 1855, Fyvie, Scotland. iv. MARGARET DUFFUS, b. December 09, 1857, Fyvie, Scotland. v. WILLIAM DUFFUS, b. November 22, 1859, Fyvie, Scotland. vi. ELSPET ANDERSON DUFFUS, b. January 05, 1862, Fyvie, Scotland. vii. JOHN DUFFUS, b. December 29, 1864, Fyvie, Scotland. viii. MARY DUFFUS, b. June 13, 1867, Fyvie, Scotland. ix. ELLAN DUFFUS, b. 1876, Fyvie, Scotland. 5. JOHN3 DUFFUS (JAMES2, JAMES1) was born February 09, 1836 in King Edward, Aberdeenshire, Scotland. i. ISABELLA4 DUFFUS, b. 1868, Tyrie, Scotland. 6. CHARLES3 DUFFUS (JAMES2, JAMES1) was born July 12, 1838 in King Edward, Aberdeenshire, Scotland. He married ELIZABETH SMART May 12, 1866 in New Pitsligo, Scotland. i. JAMES SMART4 DUFFUS, b. September 18, 1866, New Pitsligo, Scotland. ii. 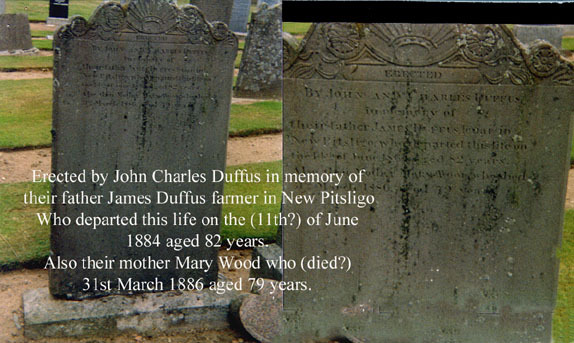 CHARLES DUFFUS, b. June 06, 1869, New Pitsligo, Scotland. iii. 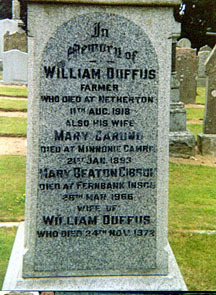 WILLIAM DUFFUS, b. September 22, 1872, New Pitsligo, Scotland. iv. EMILY MARY JANE DUFFUS, b. September 28, 1872, New Pitsligo, Scotland. 7. JANE3 DUFFUS (JAMES2, JAMES1) was born February 21, 1841 in King Edward, Aberdeenshire, Scotland. She married ?. i. ALEXANDER4 ?, b. March 31, 1862.
ii. WILLIAM ?, b. June 15, 1864.
iii. JESSIE ?, b. December 17, 1865.
iv. JAMES ?, b. January 25, 1868. 8. WILLIAM3 DUFFUS (WILLIAM2, JAMES1) was born 1820. He married AGNES RENNIE. i. MARY4 DUFFUS, b. Unknown, Tyrie, Scotland; m. JOHN SCOTT. ii. JOHN DUFFUS, b. January 18, 1857, Tyrie, Scotland. d. Sept. 11, 1917, New Pitsligo. iii. JAMES DUFFUS, b. September 09, 1858, Tyrie, Scotland. iv. 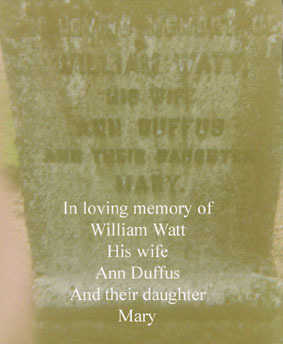 ANN DUFFUS, b. April 02, 1853.
v. WILLIAM DUFFUS, b. November 15, 1849, Aberdour, Scotland. vi. HENY DUFFUS, b. August 21, 1869, New Pitsligo, Scotland. 10. vii. 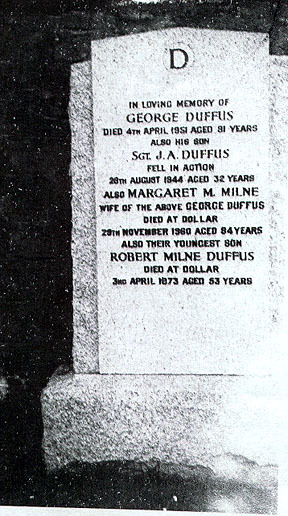 GEORGE DUFFUS, b. January 09, 1859, New Pitsligo, Scotland; d. August 1951, Auchenblae, Scotland. viii. 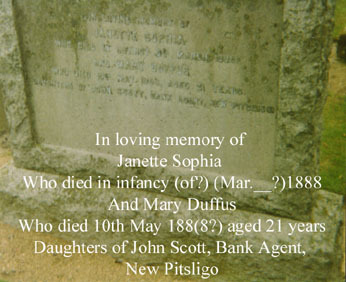 SARAH ELIZABETH DUFFUS, b. January 02, 1865, New Pitsligo, Scotland. ix. ALEXANDER DUFFUS, b. May 15, 1851, Aberdour, Scotland. x. MARGARET DUFFUS, b. February 11, 1860, New Pitsligo, Scotland. xi. 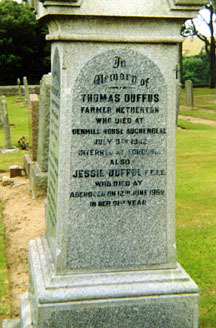 THOMAS DUFFUS, b. August 15, 1862, New Pitsligo, Scotland; d. July 09, 1942, Auchenblae, Scotland. xii. ELSPET JANE DUFFUS, b. January 02, 1865, New Pitsligo, Scotland. xiii. 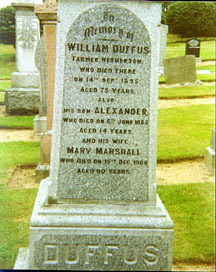 ALEXANDER DUFFUS, b. November 04, 1866, New Pitsligo, Scotland. xiv. JESSIE DUFFUS, b. January 24, 1868, New Pitsligo, Scotland; d. June 12, 1959, Aberdeen, Scotland. xv. ELLEN DUFFUS, b. May 22, 1871, New Pitsligo, Scotland. 9. JAMES4 DUFFUS (JAMES3, JAMES2, JAMES1) was born May 01, 1851 in Fyvie, Scotland. i. AGNES5 DUFFUS, b. 1882, Fyvie, Scotland. ii. JOSEPH DUFFUS, b. 1882, Fyvie, Scotland. iii. CHARLES DUFFUS, b. 1886, Auchterless, Scotland. iv. ANNE DUFFUS, b. 1888, Auchterless, Scotland. 10. GEORGE4 DUFFUS (WILLIAM3, WILLIAM2, JAMES1) was born January 09, 1859 in New Pitsligo, Scotland, and died August 1951 in Auchenblae, Scotland. He married MARGARET MIDDLETON MILNE, daughter of SHAW MILNE and ANNIE BURNS. 11. i. MARGARET MILNE5 DUFFUS, b. April 12, 1909; d. 1995.
ii. GEORGE MILNE DUFFUS, b. August 31, 1910, Auchcairnie, Scotland; m. (1) JESSIE LAWSON; m. (2) JESSIE?. 12. iii. JOHN DUFFUS, b. August 12, 1913, Auchcairnie, Scotland; d. 1982. 13. iv. WILLIAM DUFFUS, b. March 21, 1916, Auchcairnie, Scotland. v. ROBERT MILNE DUFFUS, b. August 1919, Castleton, Scotland. vi. JAMES ALEXANDER DUFFUS, b. December 11, 1918, France; d. August 28, 1944, Yville-sur-Seine, France. Burial: St. Desir War Cemetery near Lisieu, France, Grave ref. II, A, 7. 11. MARGARET MILNE5 DUFFUS (GEORGE4, WILLIAM3, WILLIAM2, JAMES1) was born April 12, 1909, and died 1995. She married WILLIAM TURNER. 14. i. DUNCAN6 TURNER, b. November 28, 1944. 15. ii. LORNA TURNER, b. July 11, 1948.
iii. AILSA TURNER, b. October 02, 1943; d. At childbirth or shortly thereafter. ; m. WILLIAM TURNER. 12. JOHN5 DUFFUS (GEORGE4, WILLIAM3, WILLIAM2, JAMES1) was born August 12, 1913 in Auchcairnie, Scotland, and died 1982. He married (1) AMELIA (AKA MAIMIE) ?. He married (2) MARIA EDITHE SOPHIA VAN BERKLE 1944.
i. JOHN GERARD6 DUFFUS, b. 1947, Columbo, Ceylon. ii. MARILYN (AKA LINNIE) DUFFUS, b. 1948, Columbo, Ceylon. 13. WILLIAM5 DUFFUS (GEORGE4, WILLIAM3, WILLIAM2, JAMES1) was born March 21, 1916 in Auchcairnie, Scotland. He married JUNE ROSE BETTERIDGE November 27, 1952 in The Parish Church of St. Alban, Dar es Salaam, Tanganyika Territory, daughter of SAMUEL BETTERIDGE and AGNES HOLMES. i. LYALL MILNE6 DUFFUS, b. September 20, 1955, Auckland, NZ. ii. ANDREW MORGAN DUFFUS, b. May 24, 1960, Waihi, NZ; m. JILL ?, December 11, 1988. 16. iii. JANET ELIZABETH DUFFUS, b. July 03, 1962, Waihi, NZ. 14. DUNCAN6 TURNER (MARGARET MILNE5 DUFFUS, GEORGE4, WILLIAM3, WILLIAM2, JAMES1) was born November 28, 1944. He married PAM STANSFIELD. 15. LORNA6 TURNER (MARGARET MILNE5 DUFFUS, GEORGE4, WILLIAM3, WILLIAM2, JAMES1) was born July 11, 1948. She married GRANT CLIFFORD. 16. JANET ELIZABETH6 DUFFUS (WILLIAM5, GEORGE4, WILLIAM3, WILLIAM2, JAMES1) was born July 03, 1962 in Waihi, NZ. She married BRETT HOW June 16, 1990 in Hevelock North, Hawkes Bay, New Zealand. i. APRIL ROSE7 HOW, b. May 21, 1994.
ii. NATHAN ALEXANDER HOW, b. March 26, 1996.
iii. ANDREW WILLIAM HOW, b. March 26, 1996. This tree was provided by Lyall Milne Duffus, 48 Rata Rd. Twizel, New Zealand 8773 and his father, William Duffus, 2/508 Charles St., Hastings, Hawkes Bay, New Zealand. Supplemented Jan. 19, 1999 by John Gerard Duffus, 167 Gilmore Place, Edinburgh, Scotland.